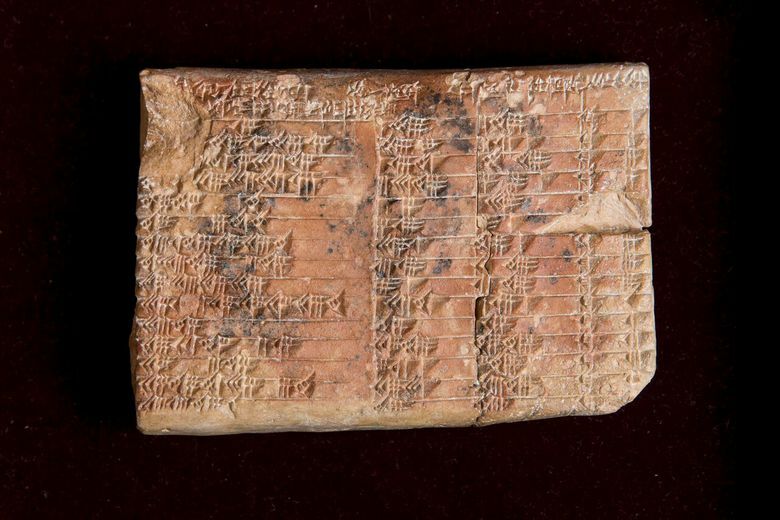 Two Australian mathematicians assert that an ancient clay tablet was a tool for working out trigonometry problems, possibly adding to the many techniques that Babylonian mathematicians had mastered. Could the Babylonians who lived in what is now Iraq more than 3,700 years ago solve a word problem like this? 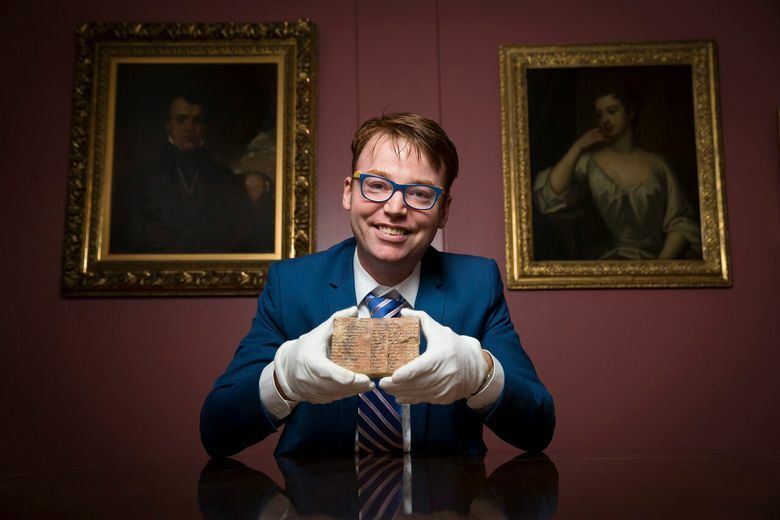 “It’s a trigonometric table, which is 3,000 years ahead of its time,” said Daniel Mansfield of the University of New South Wales. Mansfield and his colleague Norman Wildberger reported their findings last week in the journal Historia Mathematica. The tablet, known as Plimpton 322, was discovered in the early 1900s in southern Iraq and has long been of interest to scholars. It contains 60 numbers organized into 15 rows and four columns inscribed on a piece of clay about 5 inches wide and 3.5 inches tall. It eventually entered the collection of George Arthur Plimpton, an American publisher, who later donated his collection to Columbia University. Based on the style of cuneiform script used for the numbers, Plimpton 322 has been dated to between 1822 and 1762 B.C. One of the columns on Plimpton 322 is just a numbering of the rows from 1 to 15. The other three columns are much more intriguing. In the 1940s, Otto Neugebauer and Abraham Sachs, mathematics historians, pointed out that the other three columns were essentially Pythagorean triples — sets of integers, or whole numbers, that satisfy the equation a2 + b2 = c2. This equation also represents a fundamental property of right triangles — that the square of the longest side, or hypotenuse, is the sum of the squares of the other two shorter sides. That by itself was remarkable given that the Greek mathematician Pythagoras, for whom the triples were named, would not be born for another thousand years. Why the Babylonians compiled the triples and wrote them down has remained a matter of debate. One interpretation was that it helped teachers generate and check problems for students. Mansfield, who was searching for examples of ancient mathematics to intrigue his students, came across Plimpton 322 and found the previous explanations unsatisfying. “None of them really seemed to nail it,” he said. But what is conspicuously missing is the notion of angle, the central concept impressed upon students learning trigonometry today. Wildberger, down the hall from Mansfield, had a decade earlier proposed teaching trigonometry in terms of ratios rather than angles, and the two wondered that Babylonians took a similar angle-less approach to trigonometry. Perhaps the strongest argument in favor of the hypothesis of Mansfield and Wildberger is that the table works for trigonometric calculations, that someone had put in the effort to generate Pythagorean triples to describe right triangles at roughly one-degree increments. A Babylonian faced with the ziggurat word problem may have found it easy to set up: a right triangle with the long side, or hypotenuse, 56 cubits long, and one of the shorter sides 45 cubits. Next, the problem solver could have calculated the ratio 56/45, or about 1.244 and then looked up the closest entry on the table, which is line 11, which lists the ratio 1.25. From that line, it is then a straightforward calculation to produce an answer of 33.6 cubits. In their paper, Mansfield and Wildberger show that this is better than what would be calculated using a trigonometric table from the Indian mathematician Madhava 3,000 years later. These days, someone with a calculator can quickly come up with a bit more accurate answer: 33.3317.